If this has been posted anywhere else in the forum, my apologies as I didn't find it via search. Good video, I did have to watch it a number of times and honestly didn't see the illusion of the turkey skin moving until I watched it again a few minutes ago. Yeah, it is a bit freaky. Congrats on your recent fame! As a first-timer roasting a turkey breast yesterday, I would add emphasis on monitoring the temperature of the breast. For the record, I have roasted many turkeys in a Traeger but now I cook exclusively on a KJJ. The roasting instructions on the wrapper suggested 3 hours at 350F so I thought I should check at 2 hours. When I opened up the lid the bottom third of the breast was black as night. The internal temperature of the breast was 185F. Shame on me for not lifting the lid earlier during the cook but I was taught if you're looking you ain't cooking. Lucky for me I was able to salvage some of the breast meat and lucky for me we didn't have guests invited for the meal. Most people who are cooking like this are monitoring with a thermometer in the meat the entire cook. If you were cooking on a Jr then your probe might have been reading artificially low due to proximity to the cold turkey. Also, were you cooking direct or indirect? KismetKamado - I used indirect cooking. The breast was a 7 1/2# Honeysuckle brand. I preheated the KJJ to 350F (as per instructions) with the heat deflector plate on and when I put the breast on I lost about 100F. So I opened up the top vent to get the KJJ back up to 350F. Then I adjusted the top vent to maintain the temperature. The funny thing is I was checking the KJJ temperature every 15 minutes to make sure it was at 350F. Because Honeysuckle recommended 3 hours I thought I'd start checking the breast temperature at 2 hours. This is when I discovered the burnt breast. They don't call me Dumbbunny for nothin'. 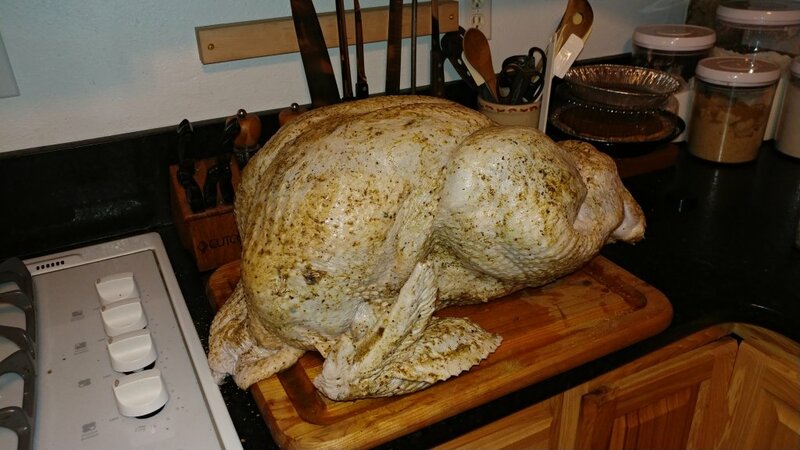 Well, I did this exact same thing on an Akorn Jr with a turkey breast, so I might be a dumbbunny too! I think if I dig through the archives I probably have the pics to prove it. I’m pretty sure what got me was dome thermometer reading too cool due to proximity to the breast. This looks like a failure to trust your Joe. You will always lose temperature when putting something cold, like food, on the grill. Always. As a result you should never adjust a stable Joe when adding food. As long as you're quick about it, you change nothing by adding food; same fire size and air flow before and after. Same cooking conditions. Give your Joe some time before doing any adjustments. Using a remote-reading, in-meat thermometer is highly recommended. Overcooking is the enemy. I am going to go for it (like I got a choice now). I did not notice a problem with the temperature probe when I tried it, but will position it so the breast of the turkey (high point) is in the back of the grill away from the probe. Wish me luck I will let you know how it goes. Well, Thanksgiving is over and the 38.4# turkey got rave reviews from our dinner guests!! As I noted earlier, I did not expect that the fresh turkey I ordered would be anywhere this size. I was hoping for something in the 20-22# range. So the big question was how to make this fit on my KJ Classic. I use the flexible cooking system rack, so what I did was to double up the heat deflectors (half moon deflectors plus a pizza stone) to reduce the potential for burning with a projected 5-6 hour cook as I needed to grill this on the lower level of the rack in order to be able to close the cover. As you can see by the second photo, the turkey took up every bit of the grill space, but it just fit. 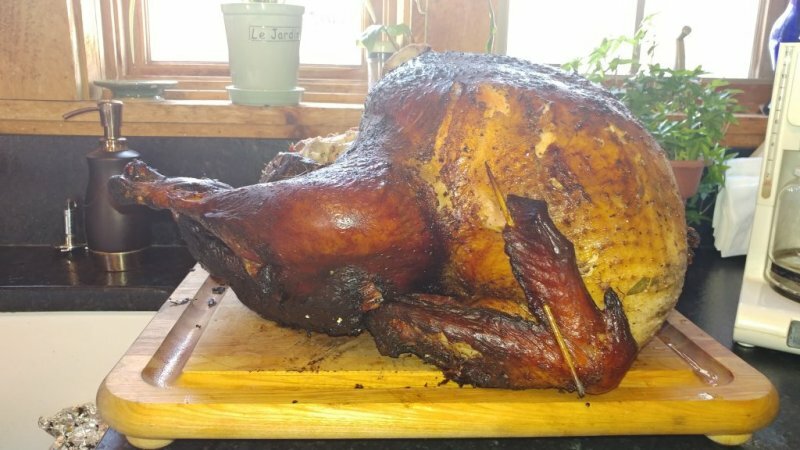 I brined the bird for 30 hours and got up at 4 am to start the charcoal and to prep the bird. I injected the bird with an olive oil-based marinade. My only regret was that by using the lower level and doubling up the heat deflectors, there was not enough room for a water tray under the bird which I normally use when grilling a turkey. I added some apple wood chunks, got the temp up to 325 and put the bird on. As I had predicted, it took 5.5 hours to reach 160 degrees. About 4 hours in, I put a tin foil tent over the bird to keep it from getting too dark. I let it rest for a couple of hours in a cooler before carving it for dinner. Super moist and tasty!! Breast meat slices were the size of a dinner plate. John, I will apologize in advance for the long message. 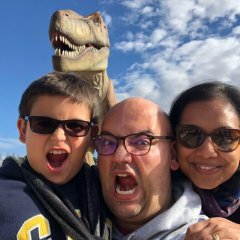 I truly appreciate the time you take to share your expertise both on YouTube and on this forum about the Kamado Joe. Thank you! 1. 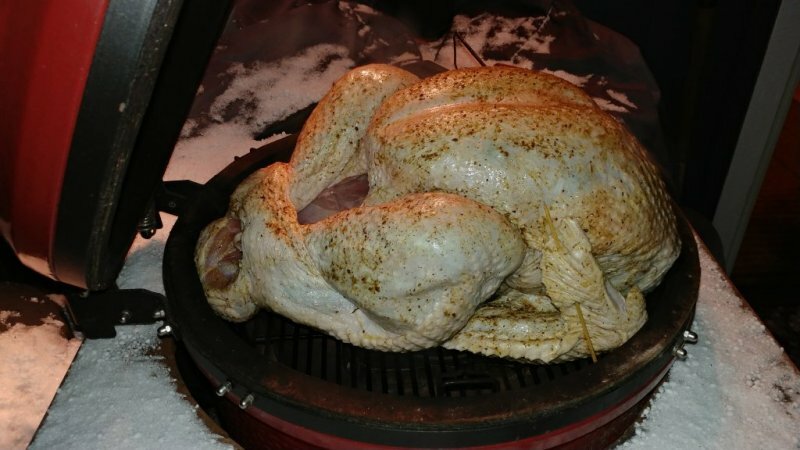 I have the Kamado Jr and a couple of weeks ago I cooked a 12lb turkey for the first time. I cooked it indirect at 350 degrees along with an aluminum pan below the turkey that had celery, onion, and carrots along with 8 cups of water. I pulled the turkey when the internal temp of the thigh meat was 165 degrees. Breast was about 174 degrees and after resting I found that the thigh meat was still undercooked. Even more frustrating was that when I pulled out the turkey there were very little drippings and all of the water had evaporated making it very difficult to make a good gravy. 2. I have a Thermo Pro TP20 that I also used for the first time. The Kamado Joe temp was 350 but the grill temp was always around 300 degrees and I had to add more charcoal to keep it at that temp. You thoughts please about that issue as well. Thank you for reading my message. 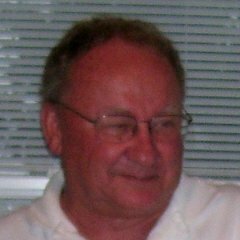 Any help is greatly appreciated. 1. Personally, I think the Joe Jr. is way too small to cook a 12 pound turkey. It might fit in there but I don't think it would cook well with most of the airspace inside the grill displaced by the meat itself. I would suggest re-trying this cook with a 6 pound chicken instead of a 12 pound turkey. You were basically steaming the turkey if you had 8 cups of water in that drip pan and had the grill running at 350f. You boiled off all that liquid and the fat drippings form your meat were probably just absorbed by the veggies in your pan. If you want to collect drippings for making gravy, you need to do so in a pan that doesn't have water or much of anything else in it. That seems to work best for me. 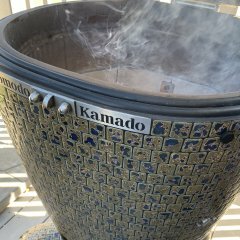 Kamado grills also retain moisture well enough on their own that you don't need to add water pans to the cook. 2. You didn't have enough room inside a joe jr with a 12 pound turkey in it to place another thermometer. Use the dome thermometer and go by whatever it says. It's also not likely to read accurately with a hunk of meat that large inside it. The thermometer is too close to the meat. You need space and breathing room inside the grill for those things to work properly. As for your done temperatures on the meat, I believe you had a rough cook here, once again, because of the size of the meat. The legs and thigh temps should have been well above the temp of the breast. Turkey meat is so tender and dietary, I definitely prefer it!